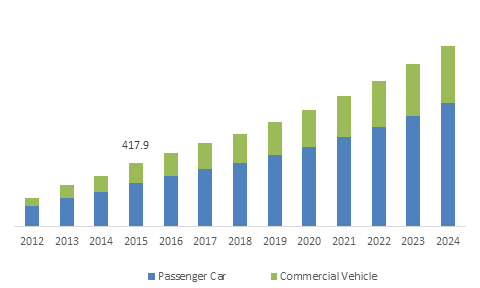 Passenger Car « Global Market Insights, Inc. The deployment of technological innovations such as integration of valve operation systemss & drive systemss will spur GDI systems market. This incorporation will bring about optimized fuel efficiency and increased fuel economy, which is the need of the hour, especially for price-sensitive consumers. Strict norms mandated by regulatory bodies to reduce the base lines of the fuel efficiency and carbon dioxide emissions will stimulate the growth of Gasoline Direct Injection (GDI) Systems Market. GDI systemss contribute to the reduction of pollutant emissions via turbocharging and are estimated to reduce around 15% of carbon emissions and fuel consumption. These benefits coupled with the rising vehicle demand and the introduction of next gen fuel saving technologies will push gasoline direct injection systems industry, slated to cross USD 10 billion by 2024, with a CAGR estimation of 12% over 2016-2024. Leading corporations have been trying to diversify their product offering by means of incorporating advanced technologies in order to gain an edge over their competitors. For instance, Denso, in 2014, declared that it planned to invest around USD 10 million at DIAM (DENSO International America) with an aim to develop GDI systems components for improving the overall product performance. These initiatives will subsequently lead to an increased consumer base, thereby propelling gasoline direct injection systems market. Industry players fiercely compete with each other on the grounds of product quality, deployed technologies, and product costs, to sustain their business position. Gasoline direct injection systems market is quite consolidated with the presence of selected companies such as Continental, MSR-Jebsen Technologies, Mitsubishi Electric Corp., Magneti Marelli, Bosch, Denso, Bajaj Auto Ltd., Stanadyne, Eaton Corporation, Delphi, and Hitachi. These companies have been making efforts to manufacture high quality and high performance exhibiting GDI systems components at lower prices to deal with their rivals. GDI systemss incorporate four major components, namely fuel injectors, sensors, electronic control units, and fuel pumps. Electronic control units accounted for the largest share in gasoline direct injection systems market in 2015, subject to the high product demand for regulated equipment control. Fuel pumps and injectors are also expected to propel GDI systems industry, owing to their extensive application across the automotive sector. APAC has been predicted to emerge as one of most lucrative growth avenues for gasoline direct injection systems market, pertaining to the extensive expansion of the automotive sector and surging demand for fuel efficient vehicles in the region. Countries such as India, Indonesia, and China are slated to be the major revenue pocket, subject to the increasing awareness regarding GHG emissions in the region. The rapid increase in the spending capabilities of consumers has led to a significant increase in the sales of automobiles across the globe. As per estimates, the United States and China are the top two nations that have the largest customer pool of passenger vehicles, which is likely to drive GDI systems industry from this application segment. Commercial vehicles accounted for more than 30% of the gasoline direct injection systems market share in the year 2015 and is estimated to grow at a CAGR of 12% over 2016-2024. This growth can be credited to the increasing demand for commercial vehicles across myriad sectors such as logistics and transportation. Europe held more than 40% of the global gasoline direct injection systems industry share in the year 2015 and is anticipated to register significant growth in the years ahead. The enforcement of Euro 5, one of the many vehicle emission standards by the European Union coupled with other stringent regulations mandates related to vehicular emissions will impel Europe GDI systems market. Automobile companies have been striving to manufacture products that comply with GHG emission standards and the Federal norms related to fuel efficiency, thereby driving gasoline direct injection systems industry. Companies have also been integrating innovative technologies in GDI systems components to improve the operational efficiency, reliability, network capability, and the overall vehicular efficiency. High initial equipment costs are likely to pose a constraint to GDI systems market over the next few years. Besides, as reported by automotive servicing personnel, the equipment depicts an increase in the carbon content, leading to blockage in fuel systemss, which will eventually increase the maintenance costs. To combat these restraints, GDI component manufacturers have been adopting laser-drilled holes that will help reduce emissions, achieve efficient fuel combustion, and eliminate unnecessary costs. Laser-based manufacturing technology apparently helps to save around 20% of the fuel consumption. The deployment of this technology will undeniably drive gasoline direct injection systems industry. 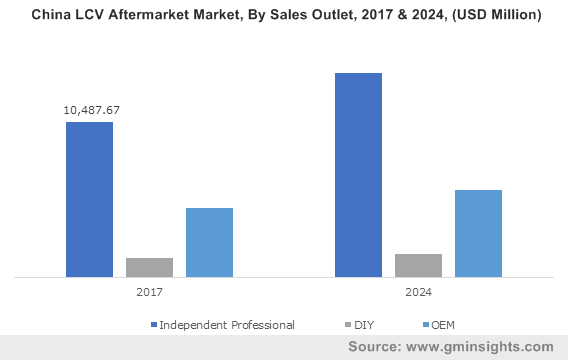 The increasing rate of automobile repair and maintenance will also fuel GDI systems market over the next few years. In addition, the characteristics such as optimized fuel consumption, light weight, high efficiency, and compactness in vehicles will lead to an expanding consumer base across the globe, driving worldwide gasoline direct injection systems market. This entry was posted in Automotive & Transportation and tagged Commercial Vehicle, Electronic Control Units, Fuel Injection System Market, Fuel Injectors, Fuel Pumps, Gasoline Direct Injection System Market, Gasoline Direct Injection Systems Market, Gasoline Direct Injection Systems Market Share, GDI System Market, GDI Systems Market, Passenger Car, Sensors.